Opossums are nocturnal animals that are extremely flexible and can adapt and survive in most conditions. They like dark places and will make their homes in attics, garages, sheds and other structures that provide them protection from the weather as well as other predators. If opossums are making a home out of your area you are likely noticing a lot of burrows being dug under fields, gardens and even your home. Or, perhaps, you are noticing that your pet food is disappearing a lot faster than it should. You may also notice your garbage cans turned over or garbage strewn about your lawn. 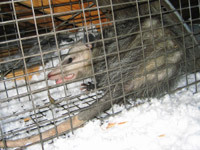 There are several ways to get rid of opossums that are causing a nuisance around your home. Since Opossums can and will feed on almost anything they find and can survive in almost any condition, you must not give them a reason to stay on your property. Pet food left in bowls outside on porches or in the yard are perfect sources of food for scavenger animals such as opossums. Keep pet food indoors or in secure areas where the opossums cannot get to it. Garbage cans provide a great source for easily getting food as well. Using metal garbage cans that can be easily and tightly secured is one way to discourage the opossums from getting into the garbage cans. Plastic garbage cans that are secured tightly with a lid may not work as opossums can chew through them to get to the left overs and food. If you have fruit trees on your property, make it a habit to take daily walks around your trees and pick up any fruit that has fallen to the ground. Look for areas around your home where opossums have easy access such as holes under porches and sheds. It is best to wait until night time when the animals have left their den to seal up the entrances they use in your home. Opossums like dark areas, so they may also choose to live in thick bushes that provide protection from the elements and other predators. Regularly trim and maintain shrubs and bushes around your property to help keep opossums from finding a place to make their dens inside the greenery. Catching an Opossum is probably the best way to get rid of them. There are all kinds of cages for catching animals; however, you must make sure you use the correct cage to catch and trap an opossum. These cages need to be large enough for an adult-sized opossum as well as sturdy since the animals are flexible and strong. Place bait inside the cage; bait can be pretty much anything as opossums will eat most anything. However, it is always better to let a professional do the task for a few reasons. The bait can result in another animal getting caught instead of opossums, for example. The placement of the cage is important. You need to carefully observe the routes the opossums use every time they come out for food. There are basically three types of traps used for catching Opossums – live capture trap, leg hold trap and the kill trap. 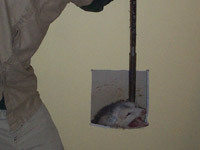 Live Capture trap can catch one or more Opossums depending on the type. Leg hold traps gets hold of the Opossum’s leg while the Kill trap chokes it to death. The last two options are inhumane and should be avoided. A professional can safely capture an opossum without harming the animal and then remove and relocate the animal to a distance far enough away from your home that they will not return. Ammonia and moth balls are common repellents sold that people try to use to drive away the opossums. Dip towels in ammonia and wipe all possible areas where you think they are residing. Also, place a few towels dipped in ammonia near their dens. There are many types of repellants and poisons available at stores; however, for the most part these do not really work to get rid of opossums. Aside from the fact that it is a very cheap attempt to use these products that claim to get rid of the opossum pest, the reality is that they are a waste of your time. And even worse, never attempt to use poison to kill an opossum. There are no legal or registered opossum poisons available for sale. And there's no reason to ever attempt to use a repellent or poison, when trapping and removal are so easy and get the job done correctly. And remember, poisons and other products may end up harming another non-targeted animal, including your pet. 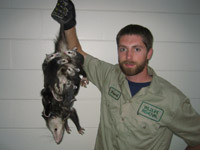 PHOTOS: For great pictures of opossum trapping and removal, click on my: Opossum Photographs gallery. Opossums are animals that can make a home near yours or on your property and because of this many people consider them pests. They are marsupials but a lot of people will tell you that they look like really big rats. They are attracted to people’s homes because they see them as shelters and also as a way to get easy food. Often they find their way to your home because of a food source such as pet food. You should know that opossums are some of the easiest animals to trap because as far as smarts go they are not the brightest of the bunch. That does not mean that you should try to trap them without knowing how to first. Having an opossum under the shed can be a bit challenging. There is simply not much room to work under there to get the opossum out. There are two things that you should know: an opossum has to leave unless it has a food source under there which is very unlikely. The second thing is that you do not need to do much work under your shed to encourage the opossum to leave; you can do something that is a lot simpler and it is also very effective. If you do see it leaving then this is the best moment to prevent the opossum from getting back in there again. Find the area the animal got through and cover it with metal or wire. The idea is to prevent them from returning once you have removed the. When an opossum actually goes into your house it can lead to a series of other problems. Depending on where the opossum is you can have a lot of noise that you do not where it comes from, feces around the house, etc. If the opossum gets in an attic or stuck in a wall it could die there causing an odor problem and a terrible amount of harmful bacteria to be unleashed in your home. At that point, the removal of the opossum can be a lot more expensive because there is potential damage to your walls. It is much better to get rid of an opossum that has gone into your house right away before the other problems start coming up. First you should try to find out where in your home the opossum is. That can be a bit challenging because if they are already in the attic then you will not be able to see them. Listen for noises and when you are certain that you have the location set up a couple of live traps. These traps can be found in some home and garden stores, and with the right bait they are really effective. There is no smell that will make opossums leave. But you can get rid of them naturally by waiting for them to exit the house, attic, shed, etc, and then sealing then entry hole shut once they are outside! If you can't time this properly (you definitely DON'T want to accidentally seal one in), then a one-way exclusion door will do the trick. Here's some bad advice that someone wrote me via email: You do not have to get a commercial repellent to get rid of an opossum. There are some natural repellents that can work. The easiest as mentioned before is ammonia, but if you want to know another type of natural repellent that you can make at home then here it is. You will need to boil about a liter of water and add about 4 to 5 tablespoons of Lapsang Souchong tea. Mix it well with the water and once the mix has cooled down, use a spray bottle on the places that the opossum is more likely to visit. Trash cans and your vegetable gardens are locations where an opossum will most likely frequent so do not hesitate to use the mixture in these places generously. In addition to this keep the area clean and free of anything they may eat. If an opossum has gone into a building that is larger than an average house, the trapping can get a bit tricky. 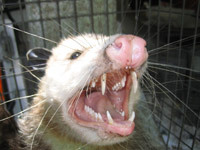 You will have a hard time looking for an opossum during the day because they are after all night creatures. In this situation you are best to seal off all entrances to the area and leave one exit open. The animal will leave during the night to scavenge and you will be able to lock up then. The tricky part is to make sure that everything was well closed off so you will only have a sturdy door to shut preventing the return of the opossum. In the event this doesn’t work the other option is to place a live trap with bait in the building and then closing it off. Bait such as wet cat food or a can of tuna will be an excellent way to lure the animal in. Once this is done you will need to carefully remove the animal and release it to an appropriate area.